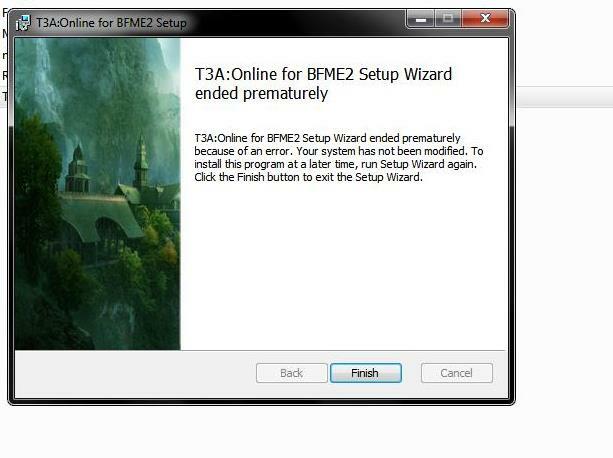 Should you experience difficulties during the installation of the T3A:O client for BFME2, please use this topic to ask for support. Questions should be formulated CLEARLY and CONSTRUCTIVELY, and describe the issue in detail. - What kind of error do you get? - What game version are you using? Solution: Download the updated Patch Switcher from here. Solution: Go to the BFME2 installation folder (Program Files\Electronic Arts\The Battle for Middle-earth™ II) Right click lotrbfme2.exe, Properties -> compatibility -> Change Settings for all users -> tick out the compatibility mode. I get that when I have the original cd in my cd drive :/ do I need a cracked exe? But there is no way to play with original disk? There is, you simply need to patch your game to version 1.06 first before you connect, and that's it. I just logged in with my original disk (English, 1.06), and I didn't experience issues so far. As others have stated, it is definitely possible to play using the original disc. I do too. I face an error though and it asks me to use Disk while my original CD is inside.Ive also tried to unistall the PatchSwitcher which was for 1.00/1.06/1.08 , then updated to 1.06 and problem still occured :S .
I got windows 7, there are not other ussers and i am the admini. I have the 3 patches switcher, i select 1.06 and neither work. ok i did everything as i was told MY ONLY ISSUE i get when trying to start the loadup in the first place is this "Please insert the correct DVD-ROM, select OK and restart application" i unistalled the game multiple times and reinstalled. i dont know what i am doing wrong. i installed it. opened it. it worked fine. got off. installed update. then online client. then says "Please insert the correct DVD-ROM, select OK and restart application".. im playing from original disk.. so why can it not read it? You'll need something like Daemon Tools to mount it, if you don't have it installed. Are you able to run the installer from the command line and send us the logfile "log.log" afterwards? Use this command in the directory where the installer is located (via cmd). msiexec /i "T3AOnlineBFME2_1.4.2.msi" /L*v "log.log"
or with "T3AOnlineBFME2_1.4.1.msi" in case you have the older launcher version. I did everything step by step. While login in ingame im getting this: "The specified account or subaccount name wasn't found." Tried with both passwords. Also i did activate the account twice to be sure. For the second it says the account is activated already. Did you type your username into the "EA Account Name" field exactly as it is here? Maybe I should register again with ingame "Register" button ? I didnt make it yet, maybe admin could firstly check whats up with the account. Edited by 3eorN', 03 April 2014 - 10:55 AM. Hi. I've had a Revora account before the release of the BFME 2 Online Servers. If I attempted to login with my current account and password in the game online network, it tells me I do not have a password for the specified account. However, when I go register for online play, it says my account is already in use, and therefore I cannot complete the online registration. Do I have to create a second account? I got in. I forgot to set my password in profile settings. Will come back to this forum should I face other difficulties. I got issues starting the game. After i press the launch button it tells me to put in the correct disk. I tried it with several images and the original cd. I installed forshires version since the installation with the original cd crashes at 99%.